Kyoto Prefecture (京都府, Kyōto-fu) is a prefecture in the Kansai region of Japan on the island of Honshu. The capital is the city of Kyoto. In the Meiji period, Kyoto Prefecture was made from the area of the former Yamashiro Province. From the 7th century through the late-19th century, the city of Kyoto was the Imperial capital of Japan. 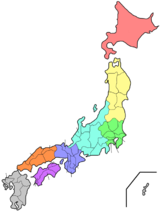 Kyoto Prefecture is almost in the center of Honshū and of Japan. To the north, it faces the Sea of Japan and Fukui Prefecture. To the south, it faces Osaka and Nara Prefectures. To the east, it faces Mie and Shiga Prefectures. To the west, it faces Hyōgo Prefecture. There are fifteen cities in Kyoto Prefecture. National Parks are established in about 6% of the total land area of the prefecture. ↑ Nussbaum, Louis-Frédéric. (2005). "Kyoto-fu" in Japan Encyclopedia, p. 587; "Kansai" at p. 477. ↑ Nussbaum, "Kyoto" at pp. 565-587. ↑ "Nationwide List of Ichinomiya," p. 1; retrieved 2012-3-14. This page was last changed on 31 August 2017, at 05:56.